Moana, Disney’s second animated feature of 2017, made a splash at the box office last Thanksgiving. But most importantly of all, it introduced the world to a culture that has been absent from the movie going experience for almost the entirety of the medium’s history. Now you can journey beyond the reef with Moana anytime you want on Blu-Ray and DVD. Moana is a young chieftess in training who has always yearned to sail away from her home island to see what lies beyond the dangerous reef. After discovering her ancestor’s wayfinding past and learning that her island is in danger, she sets sail alone to find the demigod Maui. Now the two must embark on a race against time to restore the heart of Te Fiti to the mother island before it’s too late. 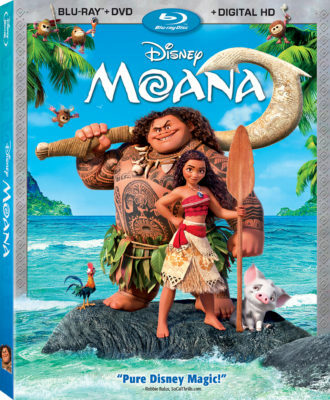 Disney Home Entertainment has pulled out all the stops with this release, giving Moana the deluxe bonus feature treatment typically only afforded to Pixar films. Hours of additional content explains the cultural inspirations behind every story element, deep analysis into the animation process, and even a new animated short created just for this release. It’s akin to the glorious 2-disc DVD sets of the past, although the majority of the features are exclusive to Blu-Ray and digital. This review covers the 2-disc Blu-Ray/DVD/Digital HD combo pack. Fans with a 3D TV will be pleased to know that a 3D combo pack is also available. With that, let’s dive in (see what I did there?) to all of the great bonus content. Theatrical Short: Inner Workings (7:12) – The short film that accompanied Moana in theaters plays after an introduction from the producer and director. Inside Bob, a human with a mundane desk job, lives his brain and heart, two organs at odds for what’s best for Bob. They will have to work together in order to help their host find happiness. Maui Mini-Movie: Gone Fishing (2:29) – In this exclusive short, Mini Maui (tattoo) helps Maui harvest food from the sea with a little help from Moana. Voice of the Islands (31:13) – Ron Musker and John Clements lead this making-of feature about the origins of the story and how it all came to be. Throughout the piece, you will meet many members of the Oceanic Story Trust who provided guidance to the filmmakers. Journey with them to the Oceanic islands that leant cultural inspiration and authenticity to the film. Warning: You might be tempted to book a trip to many of these places after viewing. Things You didn’t Know About… – Rapid-fire random questions asked of the cast and creative team. These can be viewed individually or with a “Play all” feature. Island Fashion (5:13) – Visual development artist Neysa Bové examines the costumes she designed for the film and the historical inspirations behind each one. The Elements Of… – Go deep behind the animation process with these four featurettes, viewable individually or as a “Play All” option. Mini-Maui (3:34) – Eric Goldberg returns to hand-drawn animation in this film, along with an examination of how the two mediums were combined. Water (4:38) – The technical artists reveal how they animated the ocean reacting to Moana’s movements. Lava (2:56) – Not only does Moana feature lava, but also a monster made of liquid fire. Hair (3:05) –Moana and Maui both have long hair, which created lots of challenges for the technical teams. They Know the Way: Making the Music of Moana (12:37) – Lin-Manuel Miranda, Mark Mancina, and Opetaia Foa’i discuss their approach to the music of Moana and how it all started with one jam session. Deleted Song: “Warrior Face” (3:41) – Lin-Manuel Miranda introduces this storyboarded sequence with a work demo recorded by the cast of Hamilton. 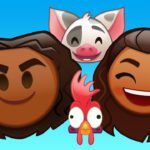 Fishing for Easter Eggs (2:52) – Auli’i Cravalho and Dwayne Johnson reveal some of the hidden Disney references in Moana. Deleted Scenes (25:56) – Seven deleted scenes from Moana are presented with storyboards and scratch voices, introduced by Ron Clements and John Musker. 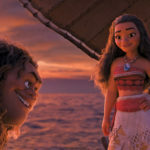 Music Video “How Far I’ll Go” by Alessia Cara (3:04) – Alessia Cara performes the ballad from Moana on a beach set to clips from the film. 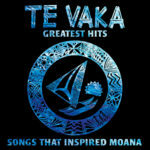 “How Far I’ll Go” Around the World (2:44) – This multi-language reel presents Moana’s ballad in such languages as Thai, Bulgarian, Icelandic, Hungarian, Tahitian, Russian, French, Spanish, Greek, Castilian, Danish, Korean, Hebrew, Swedish, German, Italian, Polish, Portuguese, Mandarin, Czech, Vietnamese, Dutch, and Japanese. Audio Commentary (1:47:12) – This feature-length commentary is lead by directors Ron Clements and John Musker, who reveal a lot of the challenges they faced while making the film. They also point out some additional Easter Eggs, but stop themselves from giving all of them away. The only bonus features on the DVD are Inner Workings, the music video for “How Far I’ll Go,” and the Audio Commentary. Moana dazzles on Blu-Ray with a breathtaking presentation. Colors are rich and vivid, allowing this 2D presentation to pop off the screen. Details are magnificent, with every strand of hair and blade of grass clearly visible. This is a film that was made to be seen in HD and the presentation is stunning. On DVD, a lot of detail gets lost as edge definition isn’t as sharp. It is also unable to match the grandeur of the film’s rich color palette, replicating earth tones and moderately bright colors well, but toning down the neons, bright blues and greens, and dark blacks. Moana’s main audio mix on Blu-Ray is a 7.1 DTS-HD Master Audio track. This enveloping mix allows the film’s glorious music to completely surround you and also makes great use of the additional rear speakers during the film’s many action moments. For a great example, check out the scenes in the Realm of Monsters. Other audio options include a stereo descriptive audio mix, plus French and Spanish 5.1 tracks. The DVD has the exact same audio options, except the 7.1 track has been swapped with a standard definition 5.1 Dolby Digital mix. It’s a fine mix, but feels compressed in comparison to the 7.1 version. Moana is housed in a standard Blu-Ray case with disc holders on the interior of the front and back covers to hold both discs. 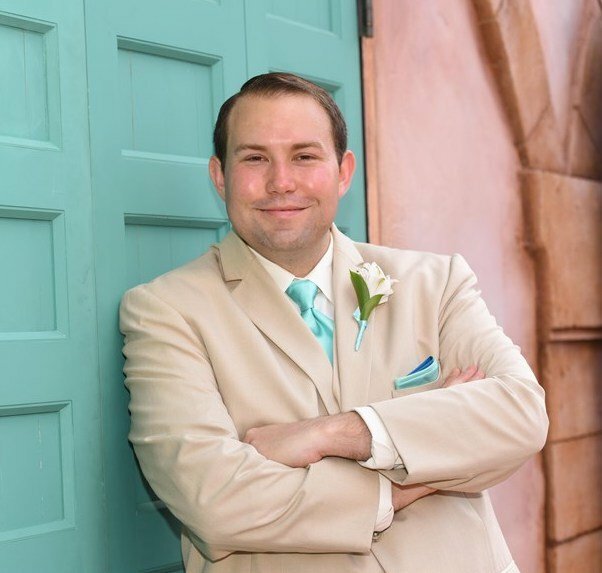 A sealed digital copy code allows you to access the film on Disney Movies Anywhere and all linked providers and also gives Disney Movie Rewards points. Another insert advertises the Disney Movie Club. An embossed holofoil slipcover is included with the initial pressing. Both discs open with an ad for Beauty and the Beast. Selecting “Sneak Peeks” from the main menu plays additional ads for Disney Movie Rewards, Descendants 2, Elena of Avalor, Aulani, and Cars 3. The main menu features patterns of tappa cloth with characters from the film moving around in front of them. Moana is a beautiful film in the rich legacy of Walt Disney’s animation studio. This Blu-Ray release offers breathtaking picture and sound, plus hours of immersive bonus features. You couldn’t ask for a more thorough and in-depth release of Moana than this one.